Syracuse packed its patented 2-3 zone defense around Zion Williamson, and dared a depleted Duke team to win from the 3-point line. 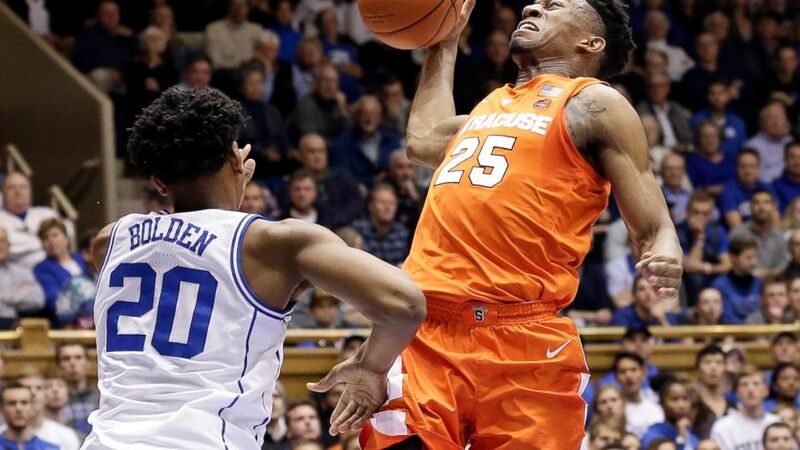 Tyus Battle scored a season-high 32 points, and Syracuse rattled Duke in overtime in a 95-91 upset on Monday night— the Blue Devils' first home loss as a No. 1 team to an opponent other than North Carolina. With Reddish out with flu-like symptoms and Jones suffering a right shoulder injury roughly 5½ minutes in — which coach Mike Krzyzewski said will keep him "out for a while" — the Blue Devils were down two starters and became a completely different team. The Orange took full advantage, forcing the Blue Devils to attempt a school-record 43 3-pointers. They made only nine. And RJ Barrett finished with 23 points, but was 4 of 17 from 3-point range — the second-most 3s ever taken by a Duke player and the most since Bobby Hurley's 18 against California in 1993. "'That's a 17-point spread. That's how much people respect you guys right now,'" Battle quoted Boeheim as saying. "We're competitors, so we took that really personal."